REALLY COOL background and REALLY COOL colors! Love it! Awesome background and colors, Shirley! A card that really pops out!! Fabulous birthday card...love those beautiful and festive colors. 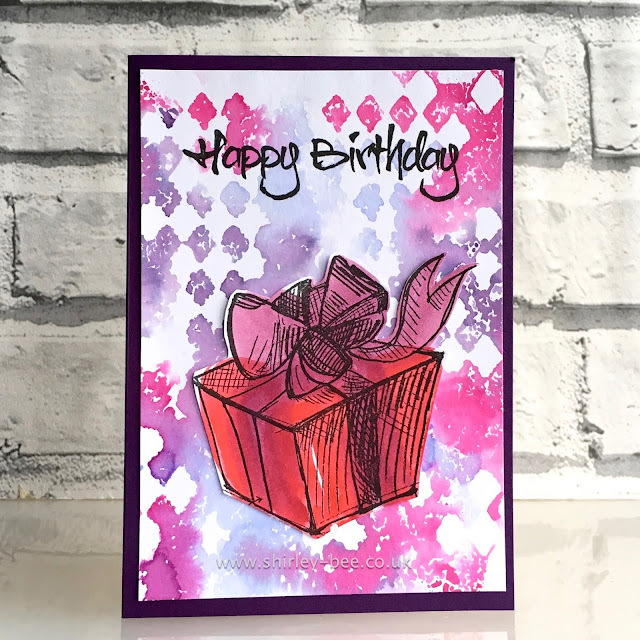 Love the stenciled background and the loose coloring on the present goes very well with that! Fabulous card, Shirley! Amazing background, Shirley! Love the vibrant colors! WOW! What a background! Really a stupendous job with our topping Shirley! What stunning colours, and such a fun 'girly grunge' card. I love it! This is so bold and fun! Love the background.